It is 30 years since the Australian environmental movement enlisted the term "wilderness" to protect Tasmania's remote Franklin River from hydroelectric development. Environmentalists deployed "wilderness" strategically during the conflict to build public support for their no-dam campaign, aided by national and international media who used the term liberally, while Tasmanian news media and pro-development elites acknowledged the term's inherent political qualities by suppressing its use. Our interest is in the political and media framing of "wilderness" since the concept was "branded" by government and industry at the turn of the twenty-first century. Drawing on continuing environmental conflict over Tasmania's remote Tarkine region as a case study, we ask to what extent media portrayals of "wilderness" have changed since the Franklin dam was stopped and the Tasmanian World Heritage Wilderness Area was created in 1982. Using content analysis of related articles in the local media and qualitative analysis of international travel journalism about Tasmania published over an extended period, we find that place branding has contributed to the routinization of "wilderness" and to a shift in the focus of mediated conflict from "wilderness" to "tourism." 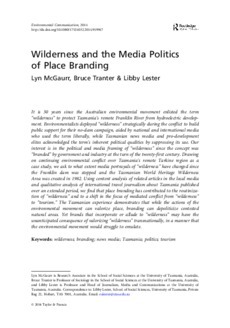 The Tasmanian experience demonstrates that while the actions of the environmental movement can valorize place, branding can depoliticize contested natural areas. Yet brands that incorporate or allude to "wilderness" may have the unanticipated consequence of valorizing "wilderness" transnationally, in a manner that the environmental movement would struggle to emulate.